Indulge your passion for the finest Belgian chocolates, exquisite cakes and decadent desserts. Enjoy a glass of champagne or a coffee as you take a delicious journey of discovery. Experience the rich, luscious flavours that only Guylian promises. Delight in our extravagant petit fours and individual desserts. Ideal for breakfast, lunch, an after work drink or even a shopping break – just indulge, enjoy, relax. Many of our customers come in either before or after the theatre. 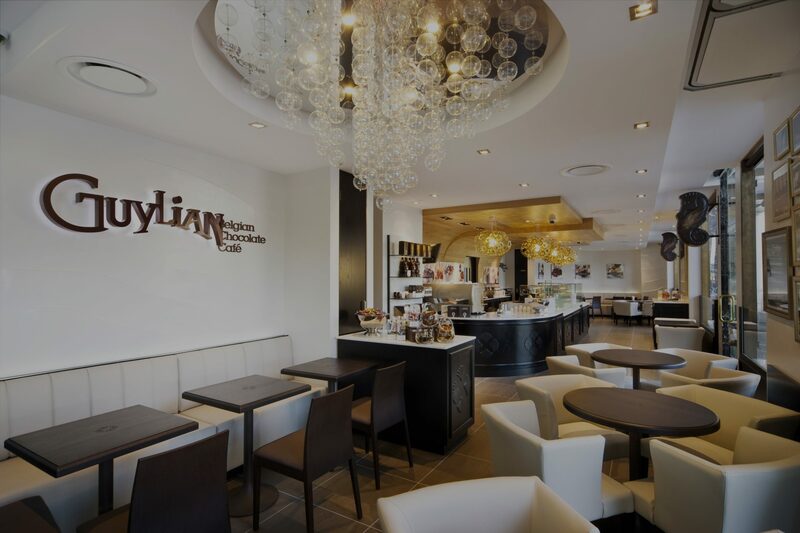 Our Guylian Belgian Chocolate Cafés are the perfect place to hand select your favourite chocolates and truffles for a special occasion or treat. Choose from the most luxurious milk and dark signatures seashells, Belgian chocolate truffles, rich hazelnut pralinés and velvety fruit mousses. 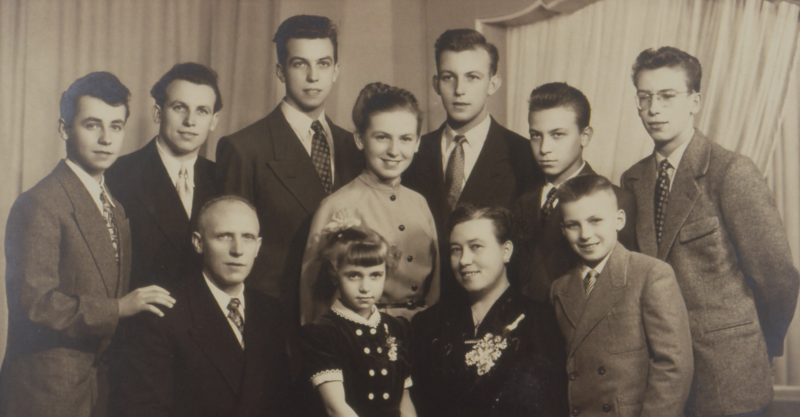 The story of Guylian began in 1958 with its founders, Guy and Liliane Foubert. The combination of their names created the name Guylian. Guylian distinguished itself from its competitors by offering chocolates in seashell shapes. This heralded the start of a worldwide success story. Guylian chocolates are internationally sold in more than 100 countries. Guylian established itself as a premium brand with international recognition offering high quality chocolate creations for gifting, sharing and self indulgence. 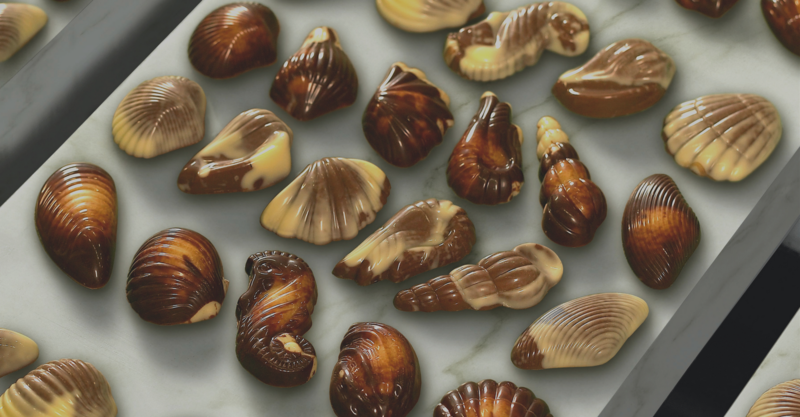 Now, many years later, Guylian seashells are still our signature chocolate. We remain faithful to the original rich praliné recipe and still pay great attention to detail. Belgian chocolate is world-renowned and is synonymous with premium quality. Guylian uses only the finest ingredients: A unique blend of West-African cocoa beans lies at the basis of high quality Belgian chocolate made with 100% cocoa butter. Only the best hazelnuts from the Mediterranean are used for their own unique roasted hazelnut praliné in their world famous Guylian chocolate seashells. Guylian still produces their hazelnut praliné according to their own recipe in the age-old traditional manner, a heritage of the company’s founding father. How Guylian roasts and caramelises the hazelnuts is a well-kept secret that gives their chocolates their velvety taste. Every time you buy a box of Guylian Belgian chocolates, you contribute to saving the seahorse and the seas they inhabit. Marine life is threatened around the world. Project Seahorse works on conservation solutions for seahorses and the ocean habitats in which they live. Guylian has been providing vital support for this work since 1999. Click here to discover more about Project Seahorse.